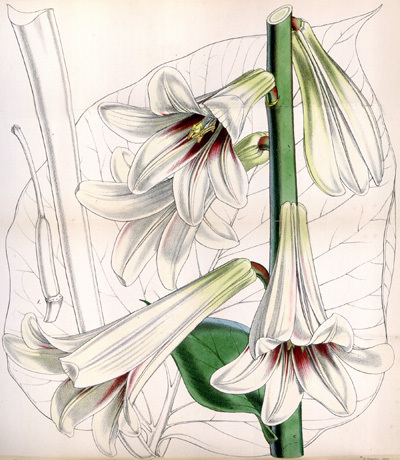 Cardiocrinum giganteum, the giant lily, is a native of the Himalayas where it is found growing in wet forests at 1600- 3500m, flowering in late June or July. A variant from western China, var Yunnanense has somewhat shorter, almost black stems and the new young leaves are bronze in colour. 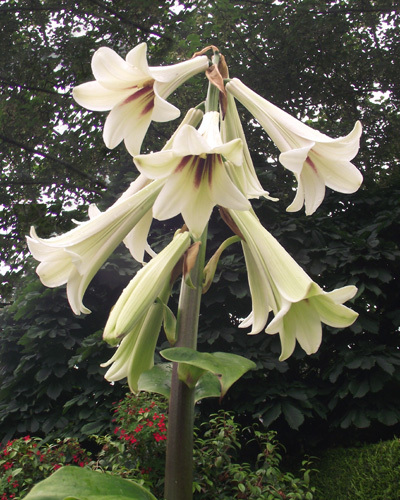 This giant lily is easily grown in moist humus- rich soil. I find it responds to a deep mulch of leaf mould in early winter and several liquid feeds after growth commences. Growth commences in early spring and the emerging buds may be damaged by frosts and care must be taken to avoid damage by slugs. Later plants may be subject to attacks by lily beetle which is a fairly new pest in Northern Ireland gardens. I find this giant lily sets copious amounts of seed which ripens in September, and while it will germinate in its first spring it does not reach flowering size for 6 to 8 years. This method of propagation is only for the most patient of gardeners ! The flowering stems of C. giganteum reach 2 to 4 m in my garden, and when it flowers its wonderful scent reaches all my neighbours on a gentle evening breeze, bringing lots of requests for a closer look !. C. giganteum is monocarpic but in the years before flowering it produces many rooted side shoots which can be replanted & should reach flowering size in 2/3 years. I have been growing this plant for over four decades and each spring I look forward to seeing the new buds emerging through the the deep mulch I have provided and of course with the promise of such delights to follow . 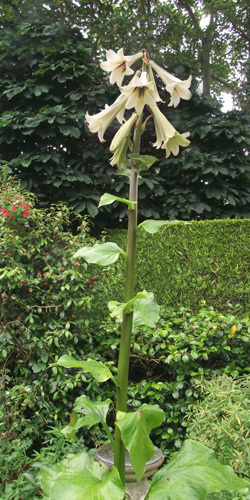 We as gardeners often complain about the damage excess rain can do to our plants; however the giant lily thrives in areas of high rainfall and recently I heard it has become naturalised in New Zealand, no doubt enjoying the temperate climate and high rainfall in its new home .